If you’re anything like me, when I’m taking a certification at any level the temptation is to focus on the areas that I feel weakest on and pay lip service to those I’m already comfortable with. For the review board this approach won’t cut it. As mentioned above, you need to understand all the available options for satisfying a requirement. Salesforce is ever evolving and you need to make sure your knowledge is bang up to date, so give the areas you aren’t worried about with the same attention as those you are. Make sure you have plenty of time to spare to get yourself to the board location. The last thing you want is to be running in flustered and already under time pressure. The same applies at the other end — allow plenty of time after the event to make your connection for travelling back. You don’t want to be distracted because you have a flight leaving in 45 minutes and the judges are still asking questions. The review board is intended to put you under pressure. 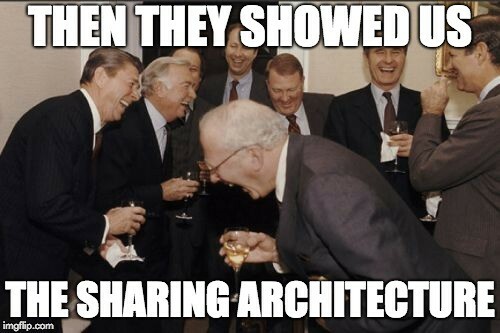 You’ll be trying to consume a lot of information in a short space of time and come up with an appropriate architecture and design that you can defend to the death. If you thought you suffered from imposter syndrome before, this will maximise the feeling. At some point in time you’ll realise that you made a bad call or you’ll get asked a question that you can’t answer. It’s the easiest thing in the world to let it rattle you and keep thinking about it as the session continues. Take a breath, or a sip of water, to compose yourself and then press on — there’s plenty of time for looking back and beating yourself up after the event. Examine everything in the sample scenario and consider all the available options. Just because you aren’t that keen on a particular feature doesn’t mean it’s not the right solution, and you need to be able to compare and contrast the various ways to solve a problem. If you don’t like territory management and always discard it from your solutions, there’s nothing to say that you won’t get a judge who loves territory management and, more to the point, has figured out that it’s actually the best approach. If you are asked why you didn’t consider it, answering that you aren’t really comfortable with it, or that you’ve always done it a different way, is unlikely to do much for you. If you realise part way through presenting your solution (or when asked a question) that you made a mistake, don’t stick with it through fear or sheer bloody mindedness. All you are doing is putting up a big target on your solution and inviting the judges to take potshots at it. Obviously this doesn’t mean that you can completely change your solution as the questions make you realise it’s all wrong, but you can tweak things if you need to. Make sure what you switch to is the best way of doing things, otherwise you just end up looking like you can’t make a decision and stick with it. As I’ve written before, in my opinion the best preparation for the review board is to carry out a variety of pre-sales engagements. The only thing better than pre-sales would be a time machine that allows you to go back 7–8 years and carry out some pre-sales engagements involving a hostile audience. I’m better known in the Salesforce community as Bob Buzzard — Umpteen Certifications, including Technical Architect, multi-time MVP and CTO of BrightGen, a Platinum Cloud Alliance Partner in the United Kingdom who are hiring.